An "exclusive" video of a recent stabbing incident aired Wednesday on ABS-CBN's morning show 'Umagang Kay Ganda' sparked online outrage. 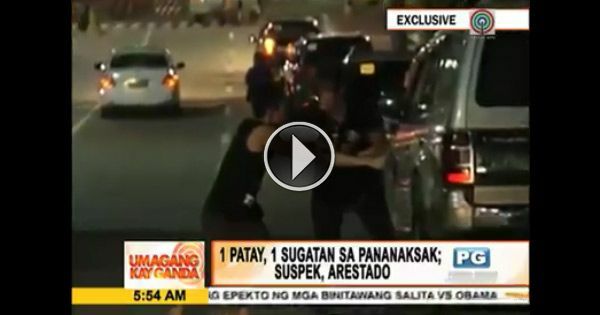 The video shows two men exchanging punches in Panay Avenue in Quezon City at dawn last Saturday, September 3. At first, it appeared to be an ordinary fist fight but when the person who took the video zoomed in, it was noticed that the shorter man was already stabbing his taller opponent on the chest and neck area multiple times. The footage also captured the suspect fleeing the crime scene as the victim slump to the ground. The report said the victim, James Chua, died on the spot. It was found out that the suspect, Melchor Española, stabbed Chua's friend, Roel Piso, earlier. The latter was reportedly brought to the hospital for treatment. Española was arrested after concerned citizens called the police and chased him. In an interview at the police station, the suspect claimed that he stabbed Chua and Piso out of revenge as the two previously connived to beat him. He is facing charges for murder and frustrated homicide. What made the victim's cousin, Raven Hagorn, and social media users furious was that, allegedly, the ABS-CBN news crew who filmed the incident from start to finish did not bother to interfere to stop the fight or even help the wounded victim. Chua could still be alive had they intervened by shouting to call attention to prevent the crime from happening or by simply calling 911 for emergency assistance, some netizens said. Others said they were wondering why the report was aired four days late. "The original airing on ABS-CBN mentioned "Nakuha ng ABS-CBN" which means they only obtained the video from someone else (random people who just happened to be in the area). Besides, it's also very unlikely that the cameraman is employed by ABS-CBN, because then they'd have to know in advance the exact spot of the future incident and then make sure to have a cameraman ready on that spot. But let's be generous and assume that they were able to predict the future and was able to pre-position a cameraman in advance. From the looks of it, it was not very obvious that the killer had a knife. That only became apparent on slow-motion during post-recording. So from the perspective of the cameraman and the people in the area, it was only an ordinary fist-fight. It was only moments later when the victim collapsed where it no longer looked like an ordinary fist-fight at all. So in terms of putting a stop to the fight, i'd say it was a gray area (you'd have to be strong or string-willed or with other people to stop a fist-fight to not have the fear of also being hurt in the process). Now, when it became obvious to the people in the area including to the cameraman that the victim is dying, then yes they should have helped specially that the assailant seemed to have fled by that time and so is no longer a present threat. The choice then is who should have helped. We don't know. Someone could have called for help and the cameraman knew and so just continued to film, or maybe nobody called for help and the cameraman is just an arse. We don't know. But I think the other people in the area have as much responsibility to help, if not more, since they are not holding a camera. So we can't put the blame here solely on the cameraman. In fact, if this incident is to be followed into its conclusion, the footage taken by the cameraman can be helpful in the court of law, and is thus a big help to the family of the victim in their quest for justice." The ABS-CBN news department has not given a word regarding the issue.